Just before next weekend, from Thursday through Saturday, Jan. 24 to 26, fifteen of Darien’s locally owned shops will be participating in Indoor Sidewalk Sales — a great time to find fabulous bargains on winter merchandise. You can find great gifts for family, friends, and yourself to fill in your wardrobe, find a Valentine’s Day gift for that special person and even buy ahead for growing children! 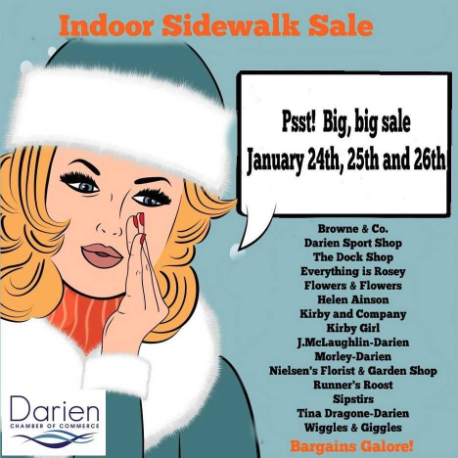 Darien Indoor Sidewalk Sales start Thursday, Jan. 24 and continue through Saturday. The participating shops are Browne & Co., Darien Sport Shop, The Dock Shop, Everything Is Rosey, Flowers & Flowers, Helen Ainson, Kirby and Company, Kirby Girl, J. McLaughlin-Darien, Morley-Darien, Nielsen’s Florist & Garden Shop, Runner’s Roost, Sipstirs, Tina Dragone-Darien and Wiggles & Giggles. The event is coordinated by the Darien Chamber of Commerce.